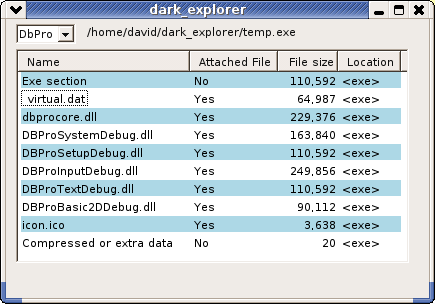 Darkbasic exes consist of a standard win32 exe with files and data appended onto the end. When the dbpro exe is run it creates a dbpdata directory in the windows temp dir. If there is an existing dbpdata dir a number is appended to the end and incremented, dbpdata1, dbpdata2 etc. until a name that doesn't exist is found. The exe then extracts the appended files into this dbpdata dir. The extracted files consist of dbpro dlls, plugin dlls, attached media and the _virtual.dat file. The _virtual.dat file contains among other things the compiled dbpro code. Dbc exes do not extract any appended files or data when run. Media is loaded without first extracting it. The following image shows the contents of an example dbpro exe. The start of a darkbasic exe is a standard win32 exe. The exe section of all dbpro exes compiled with the same dbpro version appear to be very similar for all compiled programs. The only time this section appears to differ is when you modify the exe icon or version information. The most reliable method to find the size of this section is to use some knowledge of the windows exe format. Wotsit.org has several documents that describe the windows exe format. Here is a simple function that returns the size in bytes of an exe section of a db exe. Db does not use such a method. Instead it writes the length of the exe section as a 4 byte int at the very end of the exe. This method can cause problems when you change the size of the exe, for instance when you change the exe icon or version information. Now that we know the size of the exe section we can skip it to get straight to the appended data. The format used to append the files is very simple and easy to read. Files are stored with a filename first then the filedata. Both the filename and filedata are preceded with a 4byte int which tells you how long the following filename or filedata is. With dbc exes filenames are terminated with a null byte but dbpro does not. The following image shows an example .pck file loaded in a hexeditor. Continue reading files while namelength is > 0 and < 255 or you reach the end of the file. Some code that lists the files in an exe, requires the get_exe_size function above. text 0, y, "exe section"
text 0, y, "extra data"
With dbpro exes after the files is 20 bytes of extra data. The last 4 bytes of this extra data is the size of the exe section stored in a 4 byte int. With dbc the extra data is only 4 bytes and contains just the size of the exe section. The above code will only let you view the contents of a normal dbpro exe, through the options in the IDE you can instruct the compiler to compile one of several different types of dbpro exe. For all of these types the standard exe section is identical. All types can also contain attached media files. Any media files will have a "media\" prefix on the filename. The dbpro media loading commands automatically check for attached media so you can add and remove media from the exe without problems. It is possible to change a compiled exe of one type into any of the other types. Normal Executable - The default option and by far the most popular, this is the format discussed above. Executable with .Pck file - Instead of being appended to the exe the files are placed into a .pck file. The above types can also be optionally compressed. Almost all dbpro exes you find will be in this format as it's the default option and the most practical. Consists of a standard exe section followed by the attached files and ends with the extra data. Instead of appending the files to the exe they are stored in a .pck file. The .pck file will have the same name as the program just with a .pck extension. Files are stored in the .pck file in the same format as they are appended to the exe. Pck files do not have the extra 20 bytes of data at the end. To identify this type of exe check for a .pck file or see if the exe section is the same size as the exe. Using these two functions is fairly simple but requires the following winapi functions. 2. Following compress.dll is the compressed data, load it to memory ignoring the last 20bytes of extra data. 4. decompress_block returns a handle to a memory object, use GlobalLock on this handle to get normal memory pointer. 5. Use GlobalSize on the handle to find the size of the decompressed data. 6. Write a normal dbpro exe section to disk, then the uncompressed data followed by the 20 bytes of extra data. 1. Source compress.dll from the dbpro compiler\plugins directory or another source. 2. Load a dbpro exe into memory discarding the exe section and 20 bytes of extra data. 3. Call compress_block passing it a pointer to the uncompressed data and its size. 4. compress_block returns a handle to a memory object, use GlobalLock on this handle to get normal memory pointer. 5. Use GlobalSize on the handle to find the size of the compressed data. 6. Write a normal dbpro exe section to disk, followed by the compress.dll you used as a normal attached file. Then write the compressed data followed by the extra data. Dealing with .pck files is similar just with no exe section or extra data. We can inject are own compress.dll as the first attached file in a normal dbpro exe or .pck file. Then when the dbpro exe is run it will call our decompress_block function passing it the already decompressed data. A simple C example that shows a message box asking the user if they want to continue running the exe. Show a user friendly message box if the correct version of DirectX isn't installed. Show a display mode dialog and alter the _virtal.dat file in memory so the exe starts in the correct mode. Convert dbpro to a runtime style system with small exes by souring the dlls from the dbpro install dir. dark injector is a simple program to inject a custom compress.dll into a dbpro exe. exe shrink is an implementation of a runtime style system that uses a custom compress.dll to source the dlls the exe needs from an external location that can be shared by many exes. Other than the standard exe section which changes when you use a different icon or version information _virtual.dat is the only file that differs between dbpro exes. You can therefore conclude the compiled code and other settings are stored in the _virtual.dat file. At the very start of the file are 4 4byte integers. These four ints contain the settings for the initial display mode in this order. The values of the width, height and depth are obvious, the displayMode values are as follows. By modifying these 4 ints it's possible to change the initial display mode of a compiled exe. Unfortunately lots of people for some reason ignore the display mode settings in the IDE and use SET DISPLAY MODE in their code instead. Setting the initial display mode will then not change the display mode, however you can set the initial display mode to the same as the mode used by SET DISPLAY MODE, sometimes this can reduce monitor flickering when the exe starts. After the display settings is a null terminated string that is used as the window caption. Changing this string is easy if the replacement text is the same length, just swap the characters for the new ones. It is also easy to replace with a shorter string, just swap the characters and add a null character at the end. Leave the extra characters from the original string in place so the _virtual.dat file remains the same length. Sometimes it is even possible to replace it with a longer string, just overwrite the data following the original string. dark_injector - Simple implementation of the compress.dll code injection trick. Includes some simple compress.dlls and a program to inject them into a dbpro exe. exe_shrink - Reduces exe size by removing dbpro dlls. Dlls are sourced from the dbpro install directory and added back into the exe at runtime using the compress.dll code injection trick. Dbp unchained - An unofficial collection of research, observations and commentary on the architecture of DarkBASIC PRO software.